I am thrilled to have been a CUCE-NYC intern because the experience I gained during my internship was invaluable. I truly enjoyed working with a motivated and talented team of CUCE-NYC nutrition educators. My charismatic instructor Linda Ameroso was very supportive, and also challenged us to do things on our own. She always made sure that we received proper training and learned new things every day. By interacting with people from different ethnic and socioeconomic backgrounds I was able to acquire a better understanding of the barriers to health and well-being that they faced. These experiences will prove to be particularly valuable in my future career as a registered dietitian. For example, during our cooking demonstrations in Astoria, Queens, I met a Hispanic woman in her mid-50s. She said that she comes to the market regularly to taste Cornell’s food samples. She said, “I like Cornell’s recipes because they are easy to prepare and at the same time delicious.” She admitted to me that she used to eat very little vegetables because she didn’t know how to prepare them. After trying one of the recipes at home, she realized that making a salad is not as complicated as she thought it would be. After receiving compliments from family members, she started making salads for dinner and lunch. The family enjoyed her salads very much and they asked her to make these salads more often. Eating more fruits and vegetables helped her and her husband to improve their health. Her husband who was overweight was able to lose five pounds within two months. They both started to feel more energized and less bloated. She said that she would continue attending Cornell’s cooking demonstrations to get more ideas for healthy recipes. She even created a folder with Cornell’s recipes that she said she would share with her family and friends. Bio: Kinga Raynaud was born and raised in the cultural capital of Poland, Krakow where she earned an M.A. in Cultural Resource Management. After working for five years for leading media and advertising agencies in New York City, she realized that her ambition is to help improve the world by working on health issues. She is currently working towards her Master’s degree in nutrition at Queens College. Over the past few years, she has volunteered with non-profits Bike New York, City Harvest, Food Bank for NYC, New York Cares, Heritage Health and Housing, Jacobi Medical Center and North Central Bronx Hospital. She enjoys working with culturally and socioeconomically diverse populations and she is thankful to have worked at CUCE-NYC with such an amazing group of people who truly care about the well-being of their local communities. 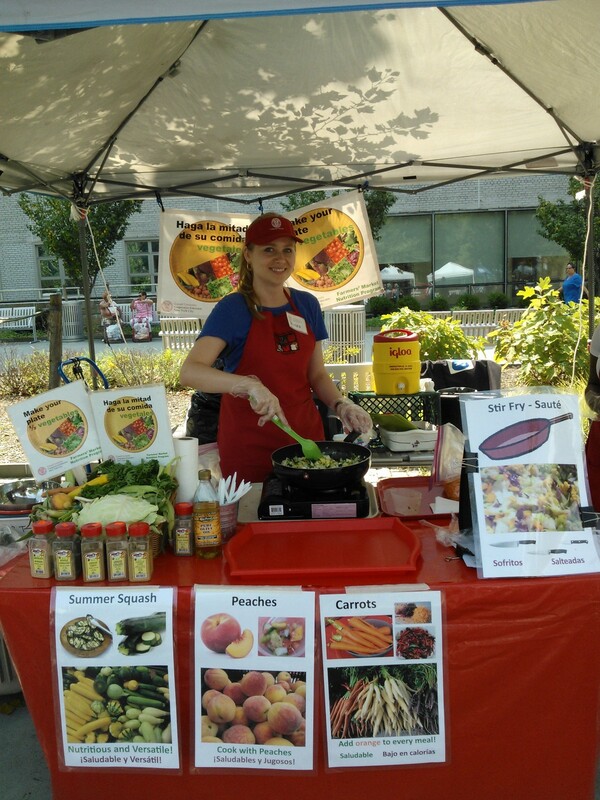 This entry was posted in CUCE-NYC INTERNS and tagged Cornell Cooperative Extension, CUCE-NYC, family, farmers' markets, food, health, healthy recipes, intern experiences, New York City, nutrition. Bookmark the permalink. ← Are You Healthy Or Not?